i had contacted Claudio(the developer) a few hours ago. He then contacted me and told that he had released ver 1.4 (beta 11).So far it works for me. I would like all of you to test it and share your results so that i can give him a feedback. Last edited by SynthLover on 04-01-12 11:23 am, edited 1 time in total. This includes my request and his response. As for the comparison with bassmidi, the problem is that bassmidi updates rarely but Virtualmidi synth updates quite frequently and is based on BASS MIDI itself. So it makes sense to look into this software in the future. (unless bass midi starts to get real serious). SynthLover wrote: I had contacted Claudio(the developer) a few hours ago. Hello everyone, I'm that developer of VirtualMIDISynth. Thanks to SynthLover I found this game and now, after making VirtualMIDISynth working with it, it's driving me nuts... can't stop playing. I read a lot of good thoughts about my work, so I decided this worths a subscription to get direct feedbacks from your community. I was in a hurry when releasing version 1.4.0-beta11, so I forgot to remove some debug code from the setup procedure; this debug code throws that "false-positive" message you mentioned. Please re-download setup again, now it's fixed (I haven't changed version number, the driver is unchanged). Final 1.4.0 version of VMS was ready to be released a few weeks ago, but there's something I'd like to fix/understand before that. During last weeks I released so frequently just because I had many bug reports from users having stuttered play on their machines. At first I thought it was related to low-performance systems, but I had reports from Core-i7 + 12GB RAM users too. So that could not surely be a CPU issue; after some tests we found that output buffering is the culprit. On some systems it must be raised up to 400ms to have a fluid rendering. Increasing the buffer means increasing latency too. That parameter is now available to the user through the advanced configuration dialog. Default value is 200ms, but in final version I'm thinking to set it to 300ms. It's a value good as default for the most of listeners/karaoke players. If someone needs lower latency could lower it and try if his system support a smaller buffer. Finally: version 1.4 of VirtualMIDISynth will be open sourced (I'm planning to put it on SourceForge because I already have other projects over there). Well, I wrote so much for my first post; now I'll start reading your thoughts and suggestions. I'm especially interested to know which value you need to set the buffer to obtain a fluid play. coolsoft wrote: Hello everyone, I'm that developer of VirtualMIDISynth. Since it's sounding like this new version works nicely with Synthesia, if you don't mind, I'd love to update the FAQ question about software synths to point to your site. The BASSMIDI guys have a tendency to move their download all over the place (I think the link is dead right now, even) and yours is already a better product. With your permission and after another few days of hearing people's experiences with VirtualMIDISynth and Synthesia in this thread, I will update the answer on that page. And because you actually have a web presence, I would link to your site vs. directly to the download. Alternatively, I can mirror the download if you're worried about bandwidth or something. coolsoft wrote: ... after some tests we found that output buffering is the culprit. Does BASS have any support for ASIO? That's usually the way to fight the large-buffer problem. If not, is there a way for you to get your hands on the audio stream yourself and send it to something like PortAudio (that has been built with ASIO support)? And while I'm at it, a couple more GM SoundFonts for your list that are really nice despite their small size are GeneralUser GS and Tim Brechbill's TimGM6mb font (at the bottom of the page). I haven't tried the Merlin font on that same page, but I hear it's also decent. However sometimes even these large soundfonts run at 0 ms flawlessly. I tested the program on an intel core 2 duo of 1.47 ghz and 2 gb ram. Also whenever i try to set the update to 7 days, it reverts back to 14 days. coolsoft wrote: I was in a hurry when releasing version 1.4.0-beta11, so I forgot to remove some debug code from the setup procedure; this debug code throws that "false-positive" message you mentioned. Nicholas wrote: If you don't mind, I'd love to update the FAQ question about software synths to point to your site. No need to ask, feel free to update your FAQ and link my site. I'm glad my work was appreciated and helpful. Nicholas wrote: The BASSMIDI guys have a tendency to move their download all over the place (I think the link is dead right now, even) and yours is already a better product. http://coolsoft.altervista.org is my home till 2006, and I'm not going to move away (unless forced by an unexpected success). Nicholas wrote: I would link to your site vs. directly to the download. Alternatively, I can mirror the download if you're worried about bandwidth or something. That's fine because it makes users more aware about what they're going to install on their PCs. If someone suggests me "download foo.exe, run it and enjoy" I always like to know who's behind foo.exe, what are its functions and if it has other functions that should be helpful for me. Direct linking also hides authors "wishes" like licensing, donations, bug reporting requests. I have no other revenues but (few) ads on my site; that's why I prevent hot-linking by redirecting users to a "welcome page". Nicholas wrote: Does BASS have any support for ASIO? That's usually the way to fight the large-buffer problem. users with devault/bundled audio devices need to install something ASIO4ALL to add ASIO support to their devices. There's nothing wrong about that, but it's against my first purpose: eliminate the needing of long chains (i.e. : VanBasco -> MidiYoke -> SynthFont). I'd like to have something working right out-of-the-box. Large buffers are not always required: on my development laptop machine, my personal desktop and laptop as long as all my virtual machines, I set it to 0 without any issue. The most performant of them is a Core-i3, going down to a Centrino. On all of them CPU is always around 1-2%. Also most of my users run VirtualMIDISynth with buffer set to 0. That's why this "bug" is driving me nuts, there's nothing worst that fixing a bug you can't reproduce. Anyway ASIO support could be added in the future with small effort. It could be because to optimize RAM usage, BASS loads samples only when needed so I suppose loading them from a big file "should" require more time (I've no knowledge about SF2 internals). BASS could be forced to pre-load needed sample but only when the MIDI file is played from BASS itself, and that's acceptable because it can pre-scan the whole MIDI and see what's needed. VirtualMIDISynth forwards MIDI commands from the (separate) player in realtime to BASS, so there's no way for the latter to preload the SF2. But, as you also said, sometimesSF2 larger than 100MB work flawlessly with 0 buffer, like on my side (I use FluidR3). SynthLover wrote: Also whenever i try to set the update to 7 days, it reverts back to 14 days. Thanks for feedback and suggestions (with screenshots ). I'm giving a look at them right now. Again i thanks to you for the VMS and i have answered in you're site. Why? because of latency and it's a standard in mao. 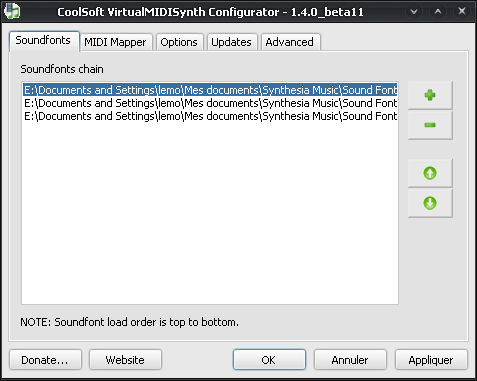 CoolSoft VirtualMidiSynth version 1.6.0 has been released. VirtualMIDISynth is now multilanguage, English and Italian for now, French and Russian are being completed. Dialogs and messages can be easily translated into other languages. @kiwi: thanks for your offer, French is actually complete. Version 1.6.1 has been released.